Pay Per Click (PPC) advertising can be a low cost way of quickly increasing traffic to your website. PPC is a form of online advertising that can give an instant return on investment. With PPC, you pay for ad space on search engine results pages (also known as SERPS)—for example Google adwords. But in order to get good search engine advertising results you have to set up and monitor your PPC campaign carefully. This is where we can help. No matter whether you choose Google adwords or something else we will show you how you can make the most of your online advertising dollars carefully researching and choosing the right keywords for your PPC campaign. We can then take charge of your online PPC campaign to ensure your ads are producing great results. Your PPC campaigns will be monitored on a daily basis and refined according to the data we gather over the course of your campaign. Monthly status reports, on-going support, and recommendations are all part of our PPC advertising service to help you grow your online business. so you get the right PPC words that work for your business. what is your competition doing and how can you successfully compete with them in your pay per click campaign? we design your PPC ad so that it will attract attention with your target audience. we design focused PPC landing pages so that they encourage people to take the next purchasing step. 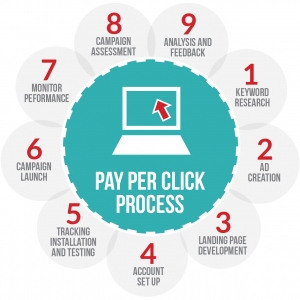 we closely monitor your Pay Per Click campaign to ensure it delivers value for you and doesn’t go over your budget. we monitor your online advertising campaign to ensure it gets results, making any adjustments along the way we think will improve your conversion rates. we provide you with all the information you need so you can make informed decisions regarding your search engine advertising campaign.